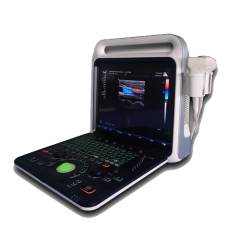 This Portable color doppler 4D ultrasonic scanner.It was developed by the R&D team of our company after repeated deliberation and development for nearly 15 months. This model has a novel appearance design with carved backlight buttons, and its knobs correspond to the display screen one by one, which is highly humanized.Let the doctor operate with ease.The main components are 128G solid-state hard disk with large capacity, which ensures the running speed and reliability of the software.Real time 3D imaging unit.Real-time 2D, blood flow and doppler three-step synchronous imaging, main functions include: speckle reduction imaging, tissue harmonic imaging, automatic image optimization, and intelligent PIP imaging mode.The built-in graphical management system can edit the diagnostic report, embed the ultrasonic diagnosis image, can link the ordinary laser printer to print directly. Tissue Doppler, Free Steering M-Mode. 4D volume probe, trans-vaginal probe,linear probe, trans-rectal probe. Distance, circumference, area, volume, angle, ratio, and stenos rate. M mode routine measurement: Heart rate, time, distance, speed, ratio, etc. Gynecology measurement: Uterus, cervix, endometrial, ovary, follicular. 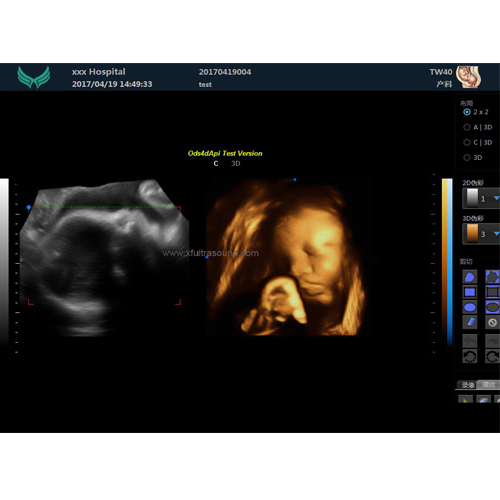 Obstetrics measurement:EGA, ETD, fetal weight estimation, AFI index, OB report (including OB tables). Urology measurement: Prostate volume, displacement volume, bladder capacity, and residual urine output. PW measurements: Time, speed, Heart Rate, RI, PI, etc. Other measurement: Slice volume measurement, hip joint angle measurement. Host appearance size: 380 ×212×390(length × width × height) (mm3).